BERLIN: German Chancellor Angela Merkel, bruised by half a year of post-election coalition haggling, was on Wednesday narrowly confirmed by parliament to her fourth and likely final term at the helm of Europe's biggest economy. Lawmakers in Berlin's glass-domed Reichstag voted 364-315 with nine abstentions for Merkel, who was then formally appointed by President Frank-Walter Steinmeier before taking the oath of office. The outcome of the secret ballot suggested 35 lawmakers of her new right-left coalition bloc voted against Merkel, giving her a thin nine-vote margin that opposition parties were quick to label a "rocky start" for a spent and joyless governing alliance. 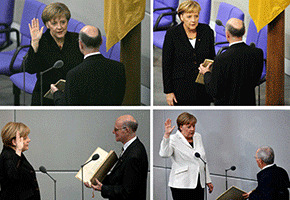 Merkel, wearing a necklace in the national colours black-red-gold, nevertheless beamed with joy and relief as applause filled the Bundestag chamber, where her scientist husband Joachim Sauer and her 89-year-old mother Herlind Kasner were among the well-wishers. For the veteran leader, the ceremony marked the end of a painful stretch of post-election paralysis, the deepest crisis of her 12-year career. A right-wing populist rise in September elections weakened all mainstream parties and deprived Merkel of a majority, forcing her into another unhappy alliance with the centre-left Social Democratic Party (SPD). The grand coalition, mockingly dubbed a "GroKo" in German, didn't start as a "love marriage," her designated vice chancellor and finance minister, the SPD's Olaf Scholz, drily observed this week. All coalition partners have nonetheless sought to allay fears that their marriage of convenience could break up mid-term, insisting they plan to jointly govern until 2021. From 1600 GMT, Merkel sits down with her new cabinet, in which the SPD has wrested both the trophy posts of finance and foreign affairs to the dismay of a growing band of critics within her Christian Democratic Union (CDU). To quieten the dissent, Merkel has named a sometimes outspoken critic, Jens Spahn, 37, as her new health minister and recently tapped a potential successor, new CDU general secretary Annegret Kramp-Karrenbauer. "The chancellor was, from time to time, written off in the past six months," Marianne Kneuer of Hildesheim University told Phoenix TV. "Many in the party started thinking about the future after Angela Merkel but at the same time Merkel has strengthened her position again." On Friday Merkel will head to Paris to discuss EU reform plans with French President Emmanuel Macron ahead of a March 22-23 summit, after a lengthy stretch in which Berlin was hamstrung on the European and world stage. Macron warned in the Frankfurter Allgemeine Zeitung daily that, without Germany on board, "part of my project would be doomed to failure." "We are completely dependent on each other. I do not believe for one second that a European project without or against Germany could succeed." The rise of populist fringe parties is also the central domestic threat for Merkel's new coalition, which faces the far-right Alternative for Germany (AfD) as the biggest opposition party. The AfD scored almost 13 percent in the election, capitalising on public fears over a mass influx of more than one million refugees and migrants since 2015 and angrily demanding that "Merkel must go". The shock rise of the AfD has come at the expense of the CDU, its Bavarian CSU allies and especially the SPD, all of which suffered their worst results in decades in September. While Merkel's last GroKo had a crushing 80 per cent parliamentary majority, the margin has shrunk to 56 per cent. To answer the new right-wing threat, designated interior minister Horst Seehofer has pledged a "zero tolerance" law-and-order drive and faster deportations of failed asylum-seekers. His new interior super-ministry also covers "Heimat" or homeland affairs, a term much derided for evoking Alpine vistas, beer and bratwurst but intended to recapture claims to patriotism from the AfD. Scholz has meanwhile promised to tackle another fear exploited by populists, of vanishing jobs in the age of globalisation and rapid technological change. "When we look at the Trump election, Brexit and the success of right-wing populist parties in many European countries," Scholz said, "we see there is a clear need to find new answers to the challenges of the 21st century."